Pure, one sided crap. Maybe before spewing off garbage you should look a little closer at facts. One of the founding members of Stand UP is a die hard Democrat. You did the same thing thing you accused the MCRC of doing. Throwing out labels. Btw. If you plan on suing the EPA you get the best corporate lawyers you can afford. No matter if their political agendas match yours. Thanks for your comment, Ben. I wish you’d worded it a little more politely, but it seems you’re angry, and I’m trying to figure out why. From what I can tell, the source of your consternation is my use of the word “Republican.” That’s “throwing out labels,” in your view. Clark Hill includes within its ranks one of the most powerful Republican fundraisers in the country. That’s just a fact. On the one hand, you say, that doesn’t prove a thing, because one of the founding members of Stand UP is a Democrat. On the other hand, you say, it does prove something: Clark Hill has a political agenda. I’m not entirely sure about the latter point, or at least it’s not a simple agenda that comes down to Republican vs. Democrat. They are, as you say, a “corporate law” firm, and that probably says more about their mission than any party affiliations. So we seem to agree that it’s complex and needs sorting out, and that’s what I’m trying to do by reading the complaint, doing some research and offering my thoughts. At this juncture it’s difficult to say precisely what this complex situation means for Stand UP, since as a 501c4 they don’t and won’t disclose the sources of their funding. But I don’t want to put this entirely on Republicans. Democrats from Governor Granholm to Senator Levin have been enthusiastic about the return of mining to Michigan, and support for the mining company’s agendas — as well as CR 595 — runs across party lines. I hope you’ll read subsequent posts in the series. 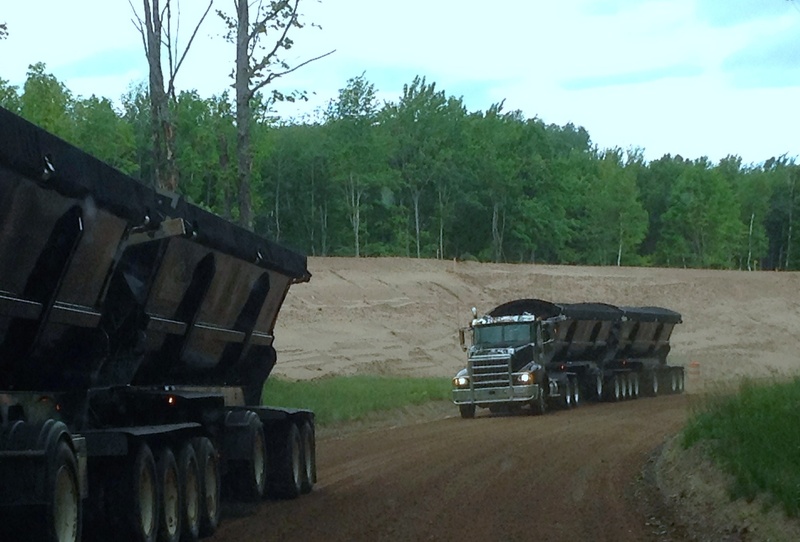 It’s time to handle this heavy-haul operation with greater safety and efficiency: a straight, relatively short, dedicated haul route between the mine and the mill as opposed to running them on a long, roundabout route through Mqt and neg/ish and along a busy highway corridor. Common sense logistics, respecting values of safety and efficiency. This isn’t a political football, it’s simply local people and their reps asking for common sense to be applied. Jeremiah: yes, people now need relief from the trucks. Don’t you think the time to work out a haul route was before the mine was permitted to open? I was surprised Lundin didn’t make that a condition of the sale from Rio Tinto. As for political football: just to be clear, I’m mainly focusing on the political posturing in the text of the complaint, as it is written, and trying to figure out what or whose ends it serves. If you value safety and efficiency, a direct haul road makes the most sense. I think part of the motive behind forcing trucks into town and tearing up our roads is because if the mine operated with very little public impact (as it would with a haul road or rail line) there would only be a few diehard anti-mine activists left. As it stands, people are constantly reminded of the mine because we see trucks all day. It’s sick, the opposition is forcing the mine to operate in a less safe and less efficient way so they can point out how unsafe and inefficient it is. Well, I see your point — out of sight, out of mind — but maybe there are people in the area who value other things over and above the efficiency of a mining operation, or think mining is unsafe to begin with. You also seem to be suggesting that the EPA objected to the road because it was in cahoots with “anti-mine activists.” Otherwise I am unsure how you would explain EPA’s refusal to remove the objections. That’s essentially the argument in the MCRC complaint I’m trying to make sense of here. How else can you explain how the Mi. DEQ approved the road then the EPA shut it down when the proposal was above and beyond the permitting requirements. Which is the entire basis of the suit. Don’t quote me but I believe then required wetland replacement amount is 7 to 1. MCRC proposed 40 to 1. And it was going to be protected wetlands. That’s my problem. Why would the EPA stick it’s nose in this anyways. I have one guess. The Huron Mountain club. Same people who sued the MCRC for ownership of a county road to keep people off the Salmon-Trout. I have no problem with any of the groups fighting this, I think they will keep Lundin on their toes keep them honest and they maybe with the environmental groups breathing down their neck all the time they will do all they can to keep it clean. We build roads all the time why is this one such a concern. How come they were able to make vast improvements to the triple a and the EPA wasn’t all over that. Who cares who STAND UP is getting their money from when the ultimate outcome of the suit will be available thanks to FOIA. How about the we find out how a government agency makes up rules as they go. How about we find out who influences them? Ben, the wetland mitigation proposals are all laid out in the complaint, which points out that MCRC went well beyond what was legally required. I am not sure what you are saying here about FOIA: as a 501c4, Stand UP is not legally required to disclose donations or donors. I’m all for sunlight and transparency at EPA and across the board. But what are we to make of an organization demanding transparency at EPA that is itself completely dark? I know everything about stand up I care to. I know the members and I know or can find out who their legal counsel is. You brought up the transparency ascpet. I brought up the freedom of information act in reference to the lawsuit and that only. As far as trying to get a donor list it will never happen, maybe there are citizens who don’t want to express the fact that they donated to stand up put out there. Their status as a 501c4 protects the donors as well. If they raised the money to do this I’m sure that there were logging companies and the such throwing in some cash , who cares. The end goal is the same. Nothing hidden. They want the road built. Big difference in asking for the names of donors that are protected by law vs. Asking why the EPA can change the rules willy nilly. Will the 40:1 wetland replacement going to be the Wetland Mitigation Bank established by the Lindberg company adjacent to the Humboldt Mill? This “mitigation bank” is going to be filled with waste water from the mill through a new outfall being built by Lindberg, and currently under review by the MIDEQ. This doesn’t fall under the legal specifications for a wetlands mitigation bank which is meant to restore functional wetlands, not create waste ponds.